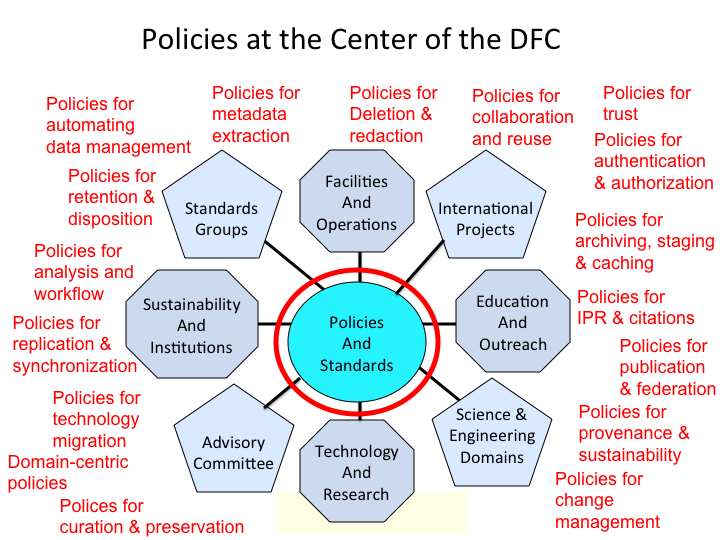 The goal of the DataNet Federation Consortium is to assemble national data infrastructure that enables collaborative research, through federation of existing data management infrastructure. The DFC seeks collaborations through six communities of practice that organize national expertise. The areas of expertise needed to build the national infrastructure include: Science and Engineering; Facilities and Operations; Technology and Research; Policies and Standards; Education and Outreach; and Sustainability. Each community of practice defines the related infrastructure and works with an extended group of experts to track evolution of the technology. Each community of practice also defines the governance policies that are needed to enforce assertions about the national infrastructure.